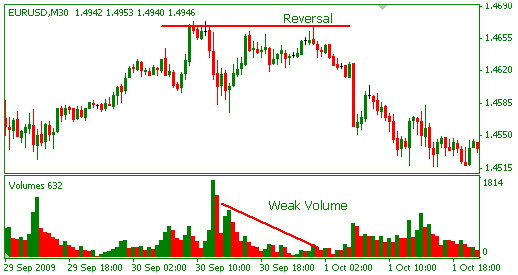 Volume is a very powerful indicator for evaluating trend strength and predicting the continuation and reversal of trends. 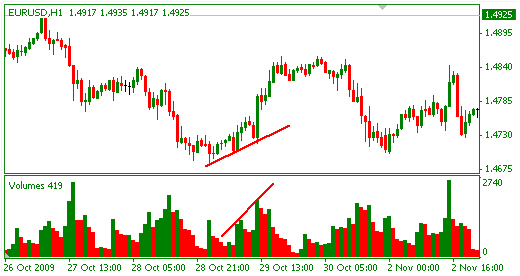 Compared to indicators that are calculated using price and therefore act after price, the volume indicator precedes price and therefore can produce very strong trading signals and analysis. Note: In FOREX, the volume is not as precise as in other commodities, because trading is taking place at many brokers and not centralized at one location. 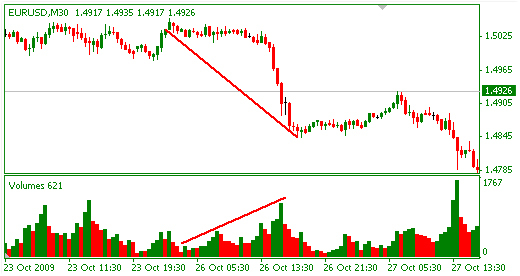 Having said that, accurate volume can be reached in more sophisticated charting software such as the ProRealTime. The drawback is that they are not free as MetaTrader is. 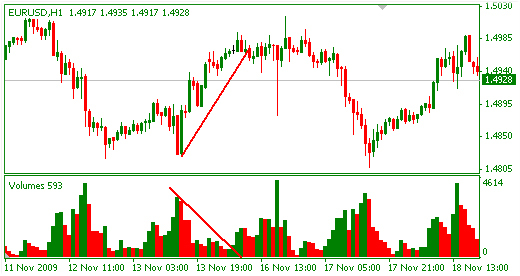 Nevertheless, volume in MetaTrader can also be useful for gauging the market action level. A bullish trend with rising volume – This is the most positive scenario. It shows that the buyers are gaining strength and the buyers are accumulating. This indicates a bullish strength. A bearish trend -The bearish trends slightly differs from bullish trends in their relation to volume. While it is highly recommended that bearish trends are accompanied with rising volume, bearish trends can advance even without volume(!). The market trends down easier than it trends up, and therefore the volume needs not be as rising for a bearish trend to continue. On the contrary, weakening volume can suggest a failure to break a psychological level and the likelihood of price to bounce and reverse on such level. Low volume indicate weakness of market participants that will not suffice to break a strong level. Volume can be a very insightful indicator over price-action, sometimes more powerful than standard indicators, as it precedes price and not calculated after price. 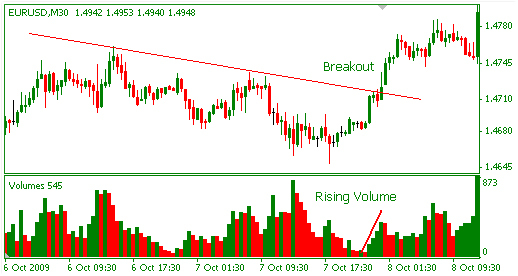 Using Volume in your trading and analysis can highly increase your performance.